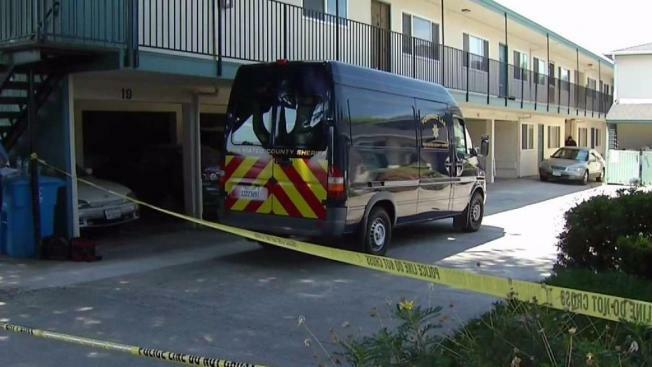 A man was shot dead in a Burlingame apartment early Saturday morning. Christie Smith reports. A man was shot dead in a Burlingame apartment early Saturday morning, marking the Peninsula city's first homicide of 2017, according to police. Police said they responded to the 500 block of Ralston Avenue around 5:15 a.m. There, officers found a man with at least gunshot wound, who died. The crime may have occurred at a party or some type of get-together where roughly six people were gathered, police believe. Police have not yet provided suspect information or confirmed a motive for what they say was an isolated shooting. Neighbor Marshae Glenn said she was asleep in her apartment when she was woken up by the uncommon sound of gunshots. "I've been here for a year and six months, never any commotion this serious," she said. A car was later towed away from the area to be examined for any potential evidence, according to police.